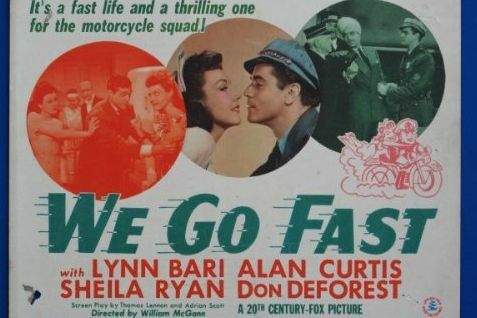 What '40s "B" movie fan could resist a title like WE GO FAST (1941)? Not me! Although sadly it must be admitted that this 20th Century-Fox film about motorcycle cops doesn't live up to its cute title and good cast. 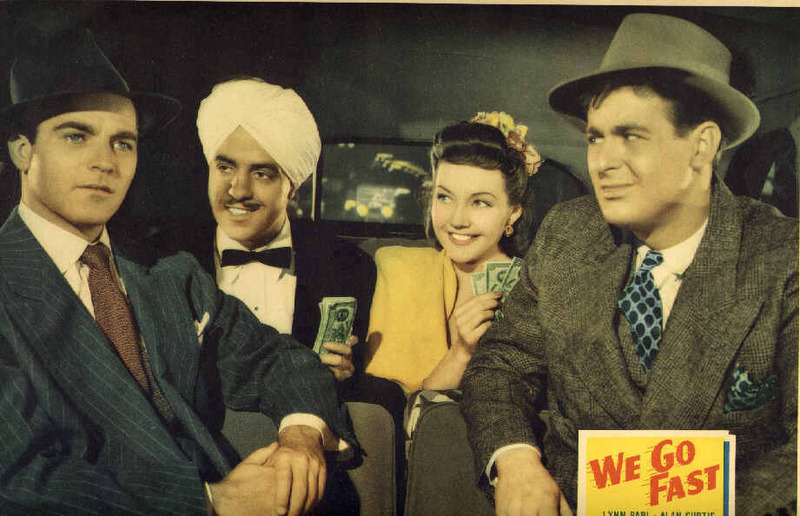 The almost plotless 64-minute movie is a series of incidents involving a bickering foursome: doofus motorcycle cop Hermann Huff (Don DeFore, billed as Don DeForest) and rookie cop Bob Brandon (Alan Curtis of PHANTOM LADY); Rosie (Lynn Bari), the waitress at Billy's Beanery who dates both the cops; and lead-footed icebox heiress Diana Hempstead (Sheila Ryan of RAILROADED!). They all become mixed up with a visiting foreign emissary (Gerald Mohr) who turns out to be a con man; potential viewers may wish to be warned that the man is referred to several times in a very unpolitically correct manner by modern-day standards. By movie's end, the cops and Rosie are back in the diner discussing who's going to go out with who. It's all pretty weak tea, as the saying goes, although it's always good to spend time with Lynn Bari, in particular. I also enjoyed picking out various faces from among the large supporting cast, such as Barbara Pepper as a Southern belle who gets a traffic ticket and Gladys Blake (Maisie from the Dr. Kildare series) as a hotel maid. WE GO FAST was directed by William C. McGann. It was filmed in black and white by Harry Jackson. At present this movie is not available on DVD or VHS. Fans of motorcycle cop movies are advised to stick with MGM's CODE TWO (1953), released a dozen years later. Still, despite the movie's flimsiness, I was glad to check this obscure film off my Lynn Bari viewing wish list! I didn't watch this one all the way through, but from what I saw, I would concur: for Lynn Bari completists only. LOL. I guess I can count myself as a Bari completist. But yeah, it was one of the sillier films I've seen in the last few months. Appreciate your help in being able to check it out very much! !